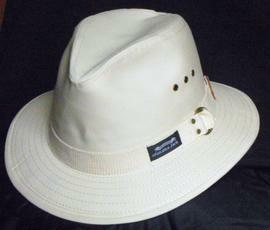 This is the hat that many of the ECB First Class Panel umpires wear. Fully structured, made of all natural canvas, and leather with a matching web band. Rated UPF 50+ sun protections. Protects face and ears from the sun with a 2" brim. This hat is delivered to you in a made-to measure box.